We love our Great Pyrenees Crazy Daisy! © 2010 FarmgirlFare.com, the all night bark-a-thon foodie farm blog where Daisy's livestock guarding partner is Marta (aka Marta Beast and Marta the Mess), a tri-mix (Great Pyrenees, Anatolian Shepherd, and Kommondor) who looks and moves like a big goofy, adorable Muppet and is usually too busy working to pose for cute pictures. She's doing just fine—and is now even bigger than Daisy! I'll be writing more about Marta soon, but in the meantime you can see some recent pictures of her here(there's also a bunch of information about how our three dogs work around the farm in the comments section of this post), and get to know her better here. One word: precious. What wonderful animals you have! Staying up barking all night long wears a girl out. Were there prowlers or predators? Or were they partying? I love Crazy Daisy! 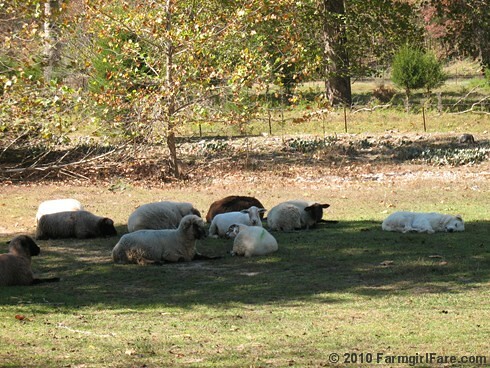 She looks right at home taking a nap with the sheep. He would love for you to join his linky Pet Party! Went back and looked at all the Marta pictures-it would be hard for me to pick a Farmgirl favorite animal, but she might be mine. Even though those baby donkeys are awfully cute. What a character she is!!! !